Looking for alternatives to chocolate eggs this Easter? 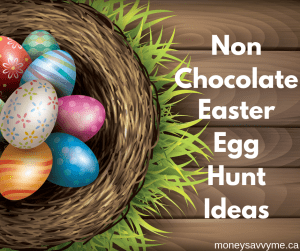 Check out this list of non chocolate Easter egg hunt ideas for your kids! Whether you choose to have less sugar in your house, have allergies, intolerances, or just have a weird (and I say this in the most loving way) child like mine who doesn’t like chocolate, you are likely on the look out for fun things for your annual egg hunt. My oldest doesn’t like chocolate. I, on the other hand can’t have Nutella in the house because I have no control. Seriously. So, I appreciate his disdain for chocolate and am willing to go with it until he realizes what he’s been missing. His little sister on the other hand, is much like me, so a huge chocolate hunt would just result in the two of us having a stomach ache for days. As a result, we focus on non chocolate treats for our annual hunt. Since my kids are still small, they absolutely love the hunt and literally could spend hours just wandering around the house picking up eggs. 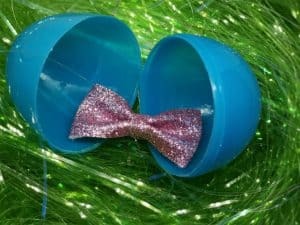 Since they are also the only grandchildren on both sides, aunts, uncles and grandparents happily spend hours putting toys into plastic eggs and then hiding them everywhere. 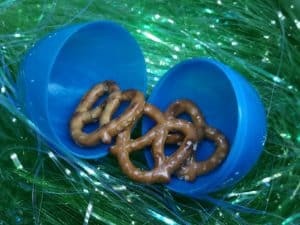 But I digress, if you are like us and want to minimize your chocolate intake, here’s 16 non chocolate ideas for Easter. 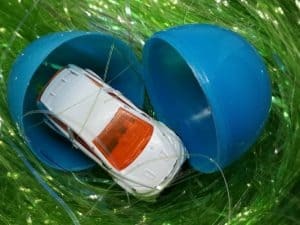 We did Hot Wheels for my eldest’s first Easter and will likely do it again this year for our youngest’s. 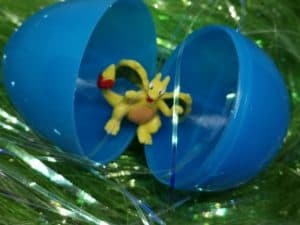 This classic toy fits so nicely in the bigger plastic eggs and will be a played with for years to come. You can buy the individual cars at Walmart for $1.25 each, or pick up a 10 pack on Amazon or at Walmart for $11.47 (making them $1.15 each). Of course, you can also check out your local Dollar Store or hit up the garage sale scene for cars at even lower prices! What kid doesn’t like stickers? Well, I guess you could say the same thing about chocolate, but we can talk in generalities for a moment. My kids are sticker obsessed! Of course, stickers for their favourite shows are always the biggest hit (which means I’m constantly ordering Pokemon stickers from Amazon), but they like seasonally themed and just whatever stickers a lot too. Stickers are really nice because they are super cheap, will keep the kids busy for a while and activate their imagination. I typically go with the bigger individual stickers for eggs, just because they seem bigger, but of course my kids probably wouldn’t care either way. They are also great when you have more than one kid and don’t have equal amounts of egg toy fillers. Just stick a few stickers in the eggs for the other kid and all will be well! Check out your local dollar store for a great selection of stickers, and of course good old Amazon will help you find stickers with their favourite characters. I also often find great deals on stickers at Michaels during seasonal clearances and with their coupon deals! My oldest is obsessed with Pokemon, which has actually served us well the past 3 Easters. Granted, we now have hundreds of mini Pokemon figurines all over the house, but the kid still plays with them on the daily and absolutely loves them. The first Easter I bought him the Pokemon figures, I found them on a Kijiji ad. I’m ashamed to admit that I paid $1 a Pokemon that year, and I don’t want to admit to how many I bought (let’s just say, more than 50). It definitely hurt my wallet, but fortunately I had some survey money on the back burner for absurd splurges like that. Since I didn’t shop around and really didn’t even think of it, I paid way too much. Fortunately, I took some time to actually research things the following year and discovered them on Amazon for a much better price. The more you buy, the cheaper they work out to be, so watch for larger lots. Of course, that does mean more eggs, but if you have more than one Pokemon fan, it can certainly work out to be a great deal! Now, Pokemon may not be your kid’s thing, or they may not be as ridiculously obsessed as mine. 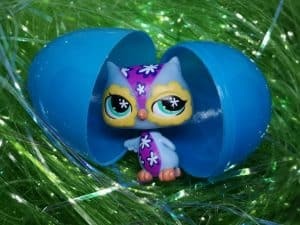 For other kids, the Littlest Pet Shop creatures make good egg fillers. Much like Hot Wheels, buying Littlest Pet Shop critters brand new will often work out to being more than $1 an item. When you’re only picking up a few, it’s not so bad, but depending on how many eggs you use in your hunt, the total can quickly add up. I tend to watch for Littlest Pet Shop to go on sale and clearance (usually Boxing week has great deals on these critters) and pick them up then. Facebook Market Place, Kijiji and garage sales are other great spots to find these at a discount. While they are pricey, if you do a big gift basket, it’s kind of fun to add one of the accessory buildings in it for hours of imaginative play. I had never heard of Twosies until I was browsing Boxing Week sales and found them at a great price. These little toys are babies with animal hats, and often they also come with the animal to match their hat. They are really cute and most easily fit in the average size plastic eggs, though some do need the bigger ones. Twoseis can be a bit pricey to buy in the bigger stores, but I have been seeing them pop up at my local Dollarama quite often. Be sure to check there for a great deal on these cute egg fillers. 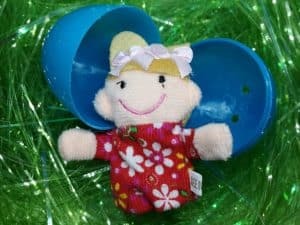 If you have some of the bigger eggs, or don’t mind spending a few extra seconds stuffing the average size one, finger puppets make for great Easter egg stuffers. Amazon has a great selection of finger puppets that include ones that are made of fabric like these animals and people (buy them in a multi-pack for a better price); and ones that are made of plastic like these squishy animals. My kids especially love the family finger puppet set, for singing the Family Finger song together! 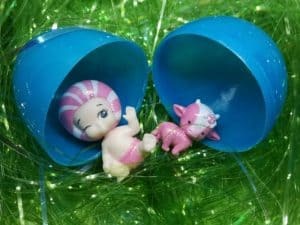 Do you remember the Fingerling craze a couple of years ago, well you can even get mini Fingerling toys that would fit in eggs perfectly! Inspire your child’s creative side with a new package of crayons. Make it even more inspired by putting each crayon in a different egg and then hiding them all over your house! At the end of the hunt, add a cute Easter colouring page that they can use their new crayons on and they’ll have a blast! Add a new colouring book to their Easter basket for even more fun! 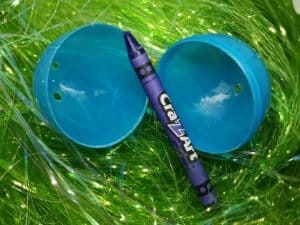 Since crayons can easily be found at the dollar store or even in your stockpile from back to school season, they are an affordable and easy Easter egg filler! Just make sure you use the bigger eggs so it can snap close! This is also a great exercise for younger kids who are still learning their colours, as they can announce each colour as they find them. Educational and fun – a win-win! I absolutely love doing puzzles. No word of a lie. So I am so excited that my older kids are now able to do them, well when the baby doesn’t try and help. We have lots of puzzles around, but there’s always room for more! 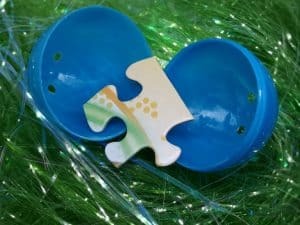 A great Easter egg hunt idea is to put a single puzzle piece in each plastic egg (just be sure to hold onto the box!) Not only is a great filler, but it also creates a fun family activity once the hunt is over. And, once the puzzle is put together, it’s a pretty good way to see if any eggs were missed along the way! Adding money to each egg is a great way to get older kids excited and into the hunt. Put a different value in each egg and see who ends up with the most in the end. Even though I mark each of my kids’ eggs, I plan on putting coins in a few of them since they are just starting to learn about money and saving for things that they really want. Add a cute piggy bank into their basket, and they’ll be set for their new money saving adventure! My daughter is three and thanks to the random shows of people playing with toys on Youtube that she loves, she has become fascinated with makeup. She also loves hair clips, even though she doesn’t tolerate them in her own hair for more than 30 seconds. Nevertheless, she’ll be getting some in her plastic Easter eggs to wear for a few seconds, and to develop her fine motor skills when she puts them on her dolls. This year, she’ll be getting some small makeup items like chapstick and nail polish in her eggs and basket. They are great fillers and certainly if you have older kids who wear makeup, you can upgrade to the colours and items they like most. If your littles are still little and learning letters, numbers, counting and phonics, magnetic letters and numbers are a great egg filler! Once I started looking for magnetic letters and numbers here in Canada when my oldest was a baby, I was amazed at how easy they were to find. I would find them in random aisles as I wandered through Fortinos, in Walmart, at the Dollarstore, and Amazon. Easy to find, affordable and a great educational toy, make magnetic letters and numbers a great non chocolate Easter egg option. What is the deal with little kids and Bandaids? Seriously. My kids are obsessed. Bump into a wall, “I need a Bandaid.” Trip over a toy, “I need a Bandaid.” Notice a smear of strawberry on your hand, “I need a Bandaid.” It’s crazy! 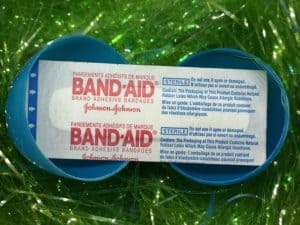 Of course, Bandaids are only exciting if they have some sort of character on them, which makes them a great choice for the egg hunt. Most character packages come in packs of twenty, so you could certainly do one an egg, or a few all in the same one. Typically we do Easter as a big event to load the kids up on the spring and summer essentials. So depending on their needs, they typically get some spring/summer sandals, a bike or other ride on toy, rain boots, water toy, sunscreen, skipping ropes, and sidewalk chalk in their big basket. Now socks don’t necessarily fit the whole spring/summer vibe that we try and go for. Nevertheless, we live in Southwestern Ontario, which means that depending on when Easter falls, we could very well still have snow. 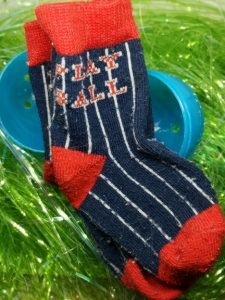 Even if Easter is later, they still need socks for when they wear rain boots and of course in their running shoes for their various athletic activities. 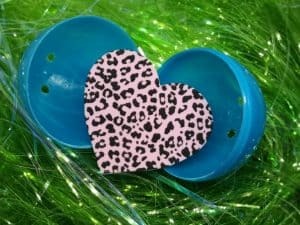 Add a pair of socks to a few eggs to make for a practical Easter gift. Just because you’ve decided on no chocolate egg hunt for Easter, doesn’t mean that other foods aren’t an option. 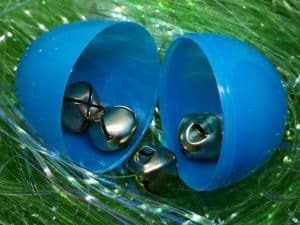 Instead of chocolate, grab some of your children’s favourite treats and fill the plastic eggs with them. Your kids will love having a special treat that fits their dietary needs, but is still fun! I’m three kids in, which means my house is over flowing with toys. Especially itty bitty toys that rival Legos for pain when you step on them. I’m honestly getting to the point where this may be our last year of tiny toys, and instead, we will move to a redemption/token system. A great option to avoid the small toys and let kids hunt for bigger prizes is by using tokens. 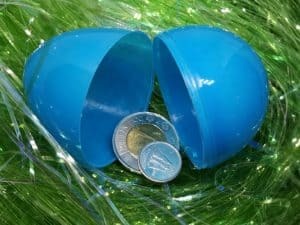 Simply add coins, slips of paper with a value on them (get a free template over at lifeasamom.com), or random household items like paperclips, or little bells in the plastic eggs. At the end of the hunt, the kids open the eggs and count how many tokens they have and then cash them in for prizes that you pre-assign a value to. 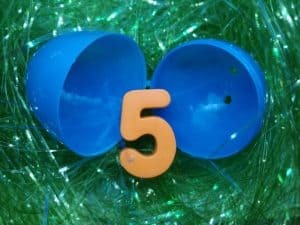 Not only is it fun to search for the eggs, but your kids also get to practice basic numeracy skills as they tally up their tokens and then plan on how they will spend them. Furthermore, it encourages them to choose toys that they really want and not waste their tokens frivolously, setting the foundation for better spending choices in the future. Take the token system one step further by adding a golden ticket to one random egg, a la Charlie and the Chocolate Factory. Personally, I would set it up so each child gets a golden ticket to redeem for one special prize. I would put a little extra care in where I hid each of those golden ticket eggs though, just to make redeeming them all the more special. 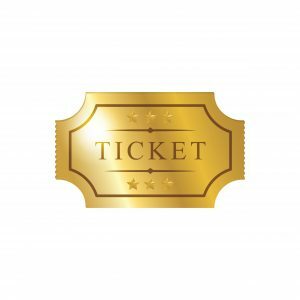 With that golden ticket, your child can choose a big or extra special prize. Maybe a bike, or a new stuffed toy, or that Peppa Pig Camper Van that they’ve been asking for non stop since Christmas! The golden ticket can be added to any egg hunt, just as that extra icing on the cake! Hope you enjoyed this list of non chocolate Easter egg items! Have any other ideas? Or have you tried any of the options listed above?